Fans of Sailor Moon and the other Sailor Senshis are in for a treat! On the Sailor Moon 20th Anniversary Talk Event held at Nicofarre last July 6, it was announced that a new Sailor Moon anime will be scheduled for release on Summer of 2013. Although there no details were mentioned of the new Sailor Moon series, the date of release was affirmed. Pretty Soldier Sailor Moon (美少女戦士セーラームーン) was a huge part in the majority of every little girl growing up in the 90’s. It tells the story of Usagi Tsukino, a klutzy, lazy 14-year-old girl who has a passion for food and video games. When she saved a black cat with a yellow, crescent mark on its forehead did her life change. The cat introduced itself as Luna and gave Usagi a magical brooch for her to use so she can transform into Sailor Moon. As Usagi finds friends in the person of Rei Hino, Ami Mizuno, Makoto Kino and Minako Aino did she discover that they are her fellow Sailor Senshi. As the anime progresses, Usagi learns the truth about her existence and her destiny. Another news unveiled for the upcoming 2013 Sailor Moon series is that famous Japanese girl group Momoiro Clover Z (ももいろクローバーZ) will be singing the original Sailor Moon theme, Moonlight Densetsu (ムーンライト伝説). This tiny bit of news alone will be keeping fans both old and new of the Naoko Takeuchi’s greatest franchise on their toes! 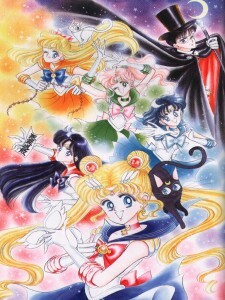 Stay tuned to Asgard for more news on Sailor Moon!